James ‘Skip’ Lazell has traveled the world studying and finding all kinds of animals. JAMESTOWN, R.I. — Even as a kid in the 1950s, James “Skip” Lazell knew there were too many people living on the third rock from the sun. He got a vasectomy in 1960, when he was 21. His evolving concerns about human population and its impact have been formulated by his life’s work, plenty of discussion and much reading, such as the controversial book “The Population Bomb” by Paul R. Ehrlich. The 1968 book sold millions. While Ehrlich’s doomsday scenario — the Stanford University biologist predicted hundreds of millions would starve to death in the 1970s — didn’t materialize, hunger is a major problem on a planet now inhabited by some 7.4 billion people. Our population is projected to exceed 9 billion by 2050. Our numbers are driving the planet’s sixth mass extinction. While global population growth must be part of the conversation about sustaining the planet, it’s seldom discussed. Lazell has seen the issue sidelined for most of his 78 years. “Sea-level rise, desertification and ocean acidification are linked to overpopulation,” he said. “Human-induced climate change is going to wipe out entire species and ecosystems. It’s likely going to end with catastrophic population decline." Lazell, however, isn’t alone when it comes to talking about an issue most of the world largely ignores. Geologist Walter Youngquist has called for a “greatly reduced” population as a critical element to the solution of natural-resource shortages. In his 2016 paper, Framework of the Future, Youngquist draws on his professional experience as a petroleum geologist and earth scientist to predict a grim future for the world’s people and its energy resources. Youngquist and the Virginia-based organization Negative Population Growth both have noted the conspicuous absence of any official U.S. population policy. Author Alan Weisman’s 2013 book Countdown looked at how many people the planet can sustain. Lazell believes it’s a billion. The longtime/part-time Rhode Islander is concerned that the crush of humanity will wipe out many of the creatures he has spent his life finding, studying and conserving. Zoologist James Lazell discovered some 30 species. ecoRI News visited with Lazell last month at his modest home on Swinburne Street, a house he bought in the late 1960s. We sat in his living room for more than an hour talking about the natural world and the many pressures squeezing it. While he has long been concerned with human population, his life’s real passion, animals, most notably reptiles and amphibians, also began when Lazell was a child. As a youngster, Lazell spent hours reading and studying his world atlas. His interest in geography often focused on islands. His scientific niche naturally grew into “island biogeography.” In its Dec. 8, 1957 edition, the Philadelphia Inquirer magazine featured an article about the 18-year-old naturalist and how he had, among other things, recently captured crocodiles in Jamaica. Lazell was born in New York City and grew up in suburban Philadelphia. His accent, however, has been softened by boyhood summers spent with family in Jackson, Miss. But Rhode Island, specifically Conanicut Island, has served as his summer and fall base for decades. Lazell earned a Ph.D. from the University of Rhode Island — he also has graduate degrees in biology and zoology from Harvard University and the University of Illinois. In 1988, in Jamestown, a friend’s mother introduced Lazell to a Chinese-born woman, Wenhua Lu, who would become his wife. Wenhua, who also earned a Ph.D. from URI, married Lazell in 1992. They don’t have any children, for obvious reasons. While zoologist Lazell focused on amphibians and reptiles — his thesis was on lizards of the West Indies — his 62-year-old wife is an entomologist with a keen interest in beetles. When he was 17, the Philadelphia Zoo paid for Lazell to go to the West Indies to collect specimens. It’s where his doctoral work on Anolis, a genus of iguanian lizards, first came into focus. He returned a year later on another zoo-funded trip. In fact, Lazell visited the West Indies every year from 1957 to 2014, making his last visit when he was 75. His favorite island there is Dominica. For this work researching clouded Anole on the uninhabited West Indies island of Redonda, Lazell rented a boat, was given a compass and was wished good luck. He loved the experience, a wide grin formed on his face when he recalled the tale. His 30 years of work on Guana Island reportedly produced the most comprehensive, long-term record of the natural history of a Caribbean island. Iguanas, salamanders, and crocodiles, however, haven’t consumed all of Lazell’s professional time. He first recognized the potential for successful reintroduction of flamingos to the salt ponds of Anegada in the early 1980s. He has been published in scientific journals more than 200 times; he’s discovered some 30 new species and rediscovered some of the planet’s rarest ones. In 1985, Lazell made Rhode Island’s first official recording of spring salamanders, commonly called gyros, in Foster. His 1976 book This Broken Archipelago: Cape Cod and the Islands, Amphibians and Reptiles has detailed chapters on 38 species of frogs, salamanders, toads, turtles, and snakes, their natural history, and how they got there. His 2005 book Island: Fact and Theory in Nature describes Guana’s flora and fauna against the backdrop of islands worldwide and their ecology, evolution and conservation. The longtime naturalist worked with the late Roger Conant, a herpetologist, author and educator who wrote one of the first comprehensive field guides for North American reptiles, in 1958. He also was director emeritus of the Philadelphia Zoo. 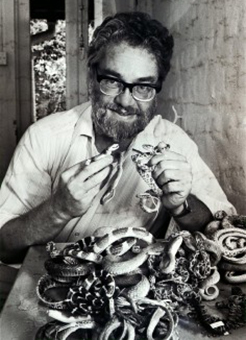 Lazell studied with the late Ernest Edward Williams, a noted Harvard University herpetologist. Before founding a Jamestown-based nonprofit in 1980, Lazell had stints with The Nature Conservancy and the Audubon Society. He taught biology at the Palfrey Street School in Watertown, Mass. He founded the The Conservation Agency to work globally to provide and publish scientific data “contributing to the protection of biodiversity and promoting sustainable relationships with valued wildlife.” Lazell was the organization’s president until a few years ago, when his former Palfrey Street School student Numi Mitchell took the reins. He said the founding of The Conservation Agency was the “biggest thrill” of his career. Now 78, Lazell, who is recovering from open-heart surgery, still speaks enthusiastically and passionately about his life’s work and the wondrous natural world in which we live. He and his wife will return to Jackson, Miss., to his late parents' home, in early November as usual, after they enjoy New England’s fall foliage and crisp air. “I was the only person to be a full-time employee at both Yale and Harvard with a full beard, earring and tattoo,” he said with a smile.